Additions include Subway WD-800 bass amplifier head featuring a tube preamplifier, 2x12, 2x15, and 4x10 Ultra-Lite cabinets, and a new Subway+ DI Preamp. MESA/Boogie is excited to announce the addition of the Subway WD-800 bass guitar amplifier, Subway Ultra-Lite 2x12, 2x15, 4x10 cabinet options and the new Subway+ Bass DI-Preamp to its line of products built in the company’s Petaluma, California shop. 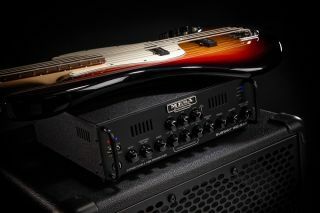 MESA reports the new WD-800 is in direct response to player feedback and the longstanding demand for a more powerful version of their original WalkAbout bass head. Their design objective was to create the ultimate lightweight hybrid by combining the warm, soulful sound of their former WalkAbout tube preamp section with the musical Class D output power used in their award-winning Subway D-800 and D-800+ bass amplifiers. As in the original WalkAbout, the new WD-800 features comprehensive rotary shelving tone controls and a semi-parametric EQ, giving bassists added shaping control in the preamp. The new WD-800 also features the Subway D-800+’s HIGH PASS FILTER and a new POWER AMP DAMPING control, which allows for tuning of the sub-low frequencies and power response options respectively. The POWER DAMPING options enable users to tailor the tracking and feel of the power amp. MESA claims that the LOW setting produces a looser, more relaxed, blooming character reminiscent of tube power, HIGH tightens the low end, adding punch and accuracy in tracking, and MEDIUM provides a blend of these opposite ends of the power response spectrum. “If you’re looking for a new, lightweight, pro-level rig to replace your heavy linear amp, this new Subway is right up your alley. We feel confident in saying you can expect bigger, fatter sound and more complex harmonic content than other lightweight options. It’s really the perfect compact, portable head for everyday gigging and recording…capable of filling the room with luscious tone and power to spare! Feedback from our bass community suggested that a new Subway that captured the feel and warmth of our former WalkAbout’s preamp would be well received. The WD-800 is everything great about our WalkAbout and Subway bass amps combined in a super-responsive compact, lightweight, big-power platform, just as fans of our bass gear ordered!” said Doug West, Director of Marketing at MESA/Boogie. To satisfy every possible wish on a bassist’s list, MESA is also introducing three new Subway Ultra-Lite cabinets. Joining the 1x12, 1x15 and 2x10 Ultra-Lite designs, players now have the added options of a 4x10 or 2x12 and 2x15 vertical formats. All are handcrafted in Petaluma, California and constructed from lightweight Italian poplar. The cabinets are tuned and loaded with custom Subway Neodymium speakers. Rounding out MESA’s new bass additions is the Subway+ DI-Preamp. The new DI-Preamp draws on the design elements from the popular Subway D-800+ amplifier, virtually all gain and level control, tone shaping, 2-band semi-parametric EQ and interface potential all wrapped in a compact DI box that’s hand-built in MESA’s shop. To find out more, head over to mesaboogie.com.